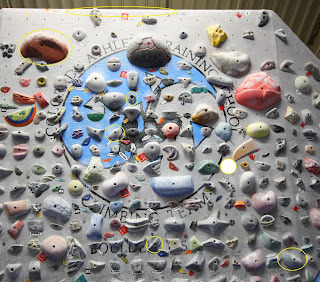 The video does not really do many of the holds justice, the most miserable is the very last hold before the finish, it is literally smaller than the majority of foot holds at the Spot, but somehow you can move off of it. 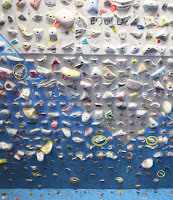 If you want to get stronger on crimps I would have to say that this is THE thing to climb on. And no I have not said that about any other problem. This is how to get finger strength. As a warning La Sportiva with feet should be a warm-up and you probably should have flashed it for this to be an option, but of course do what you want. This is where grading gets very tricky for me. 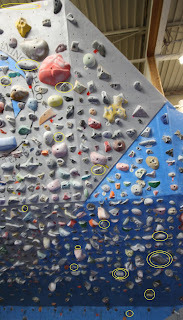 Maybe not quite flash but I did this problem first try or so, and for me it is probably as difficult as CATS V10. 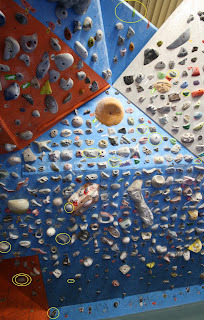 However I am not sure who would do this problem besides those who have climbed V14 outside. . . . But I could also be miserably wrong. 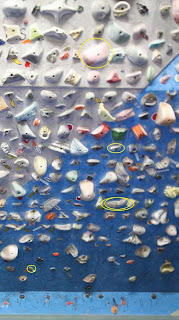 But then again maybe I am not, as there are climbers who have done V12 who have difficulty doing La Sportiva WITH feet. How hard is this? I have no idea. So it gets V12. I decided it would be good to have a cool warm up problem. 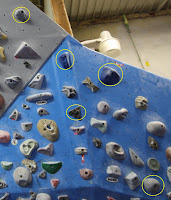 Something that was actually like a boulder problem and less just a ladder of crimps or jugs, something I would make up for myself if I was a bit weaker. I think it actually turned out pretty good, maybe has reachy feet for short people, but they have figured out a different sequence. Also no complaining about the 5th move just push with your foot and get to the hold, it's not that bad. 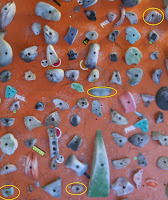 But varied movement on amazing holds. Highly recommended. Here is the video: http://vimeo.com/6820816 And a couple pictures. The hardest thing in CATS. I made this problem in a desperate attempt to try to set something that Daniel would not be able to do in a day. I failed, for a third time. On his flash attempt he got through 9 of the 11 moves. It was the most impressive thing I have ever seen in climbing. He sent in about another hour. 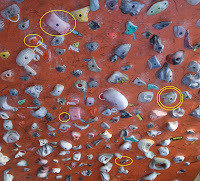 When I originally set the problem the 6th move through the 10th were all the crux and I could only do the first hard move. I still have not done the 7th move. I believe this is perhaps one of the hardest climbs in the country, potentially behind Terremer. If you do not think it can be this hard because Daniel did it in a day then you clearly just do not understand Daniel on straightforward moves on a 70 degree overhang. The problem starts with a little 5 move V8 or V9 set up problem, then a V10 move, then a V12 move, then a V11 move, to a V9 move to a V10 move to a V6 move. This is of course my feeling and I have not done the problem, but it should give a basic idea. Here are pictures, I do not think I will be getting video of this one. . .
A very old school testpiece for CATS V8 pinching. The second move is an interesting tension move and generally considered the crux, but it is relatively sustained and you can definitely even fall on the last move. There used to be a taped box to the left of the molecule to designate the finish, but it is now gone. So basically just go left hand somewhere to the left of the molecule. Here is the video http://vimeo.com/6333423 and a picture. Also as you can see in the video you are allowed to smear on the right wall, just be careful not to dab holds if you are swinging into the wall dynamically. Well I am pretty much finished with the layout and meat of the site, and have a small initial batch of problems now up, along with a ton of video(thanks Ellen!). A useful thing I just thought of is on the Problem Guide title I will keep a running number of how many problems are up on the site. So when you visit you can tell whether I have added any new problems or not since you visited last. There are still many many classic climbs that are not up on the site yet, but in the coming weeks the number of problems will at least double I am sure. The V9 section of the site is particularly sparse but this is not from a lack of problems, I have loads of V9s. But I figure I might as well wait until I have video of them before putting them up. Just come into CATS Monday, Tuesday, Thursday or Friday and I will be there and can show you infinitely more problems. 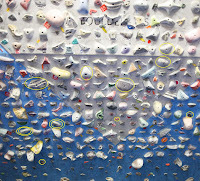 This is a good climb with small moves to warm up your fingers, it does however have a piss ton of holds and there is more than one way of doing it so the video here: http://vimeo.com/6291034 will help some and here is a picture as well, it ends on the plate over the lip. A good warm up that is harder than a ladder of jugs but does not require any fingers. There is actually a really pretty foot sequence that can be done in the upper but I totally forgot it in the video which is here:http://vimeo.com/6289242 and I will post pictures to help as well. This is a very very old problem I made up when I first moved out, perhaps the third problem overall that I set in CATS. A good mixture of power and tension on pinches and slopers makes this the Full Service of CATS V8. The original finish got moved slightly quite awhile back so the current one is somewhat half-assed. A good variation if this is not at your limit is to jump to the Egg at the end, but that could bump to V9. The video is here: http://vimeo.com/6288786 and I am giving a couple pictures as well. The video should be enough but I will run it through by words in case. Start Zbar jug, with a blue jib and a dirty yellow jib to start, left hand two screw teal crimp, into blue Teknik pinch, out to small green ETCH pinch, right foot on red jib just to the right of the big yellow loaf pinch, right hand to small tan/yellow pinch above the green font, right hand again to the pink eGrips scooped mini pinch, left hand Red Hornytoad. This is in fact the second climb my girlfriend Ellen ever set, and it turned out to be a very good climb. Cool holds, reasonable movement, good sustained difficulty, feet are a little odd to use though. But definitely fills a good niche in the V6 area. 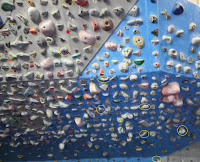 Video is here http://vimeo.com/6271360 and a picture of the bottom as well to be clear, after the last hold in the picture the video should work, but if not; black eGrips crimp, small blue sloper, three screw teal crimp rail, big yellow sandstone to finish. This is the CATS Clear Blue Skies simulator. Original concept by Anson modified and re-set by Rob, Carlo, Alex and myself. 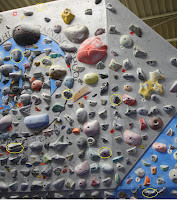 First this problem was untaped, then it had Epic tape, then the Epic traverse was set and this was reset Keen. Which fits well with the other Keen climb which is simple, short, crimpy and maybe a touch sharp. Although I realize that saying this is harder than CBS does not make this V13, this is a decent amount harder and many who have done the climb cannot do the 2nd move at all on the CATS CBS, so I will give it entry level V13. No flash ascents by the way. . .
An epic masterpiece of movement and perfect holds. 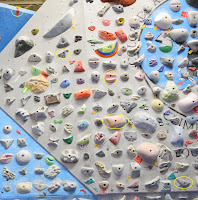 This is a taped climb that is very very hard for me to put a grade on, I did it awhile back without too much difficulty and Daniel flashed it but it has seen many many people who climb V13 and V14 fail on it so I guess I will go ahead and list it as a V13. If you send it and go "pshh that is V11" well good for you I do not really care. Green Hornytoad is also one of my current campus projects all the moves have gone, and I have had decent link starting 2 moves in and falling on the last move. The future for sure. If you can campus all the moves I will buy you 3 blocks of chalk. If you campus Green Hornytoad and your last name is not Woods, then I will name a problem after you and will treat a meal at iHop. 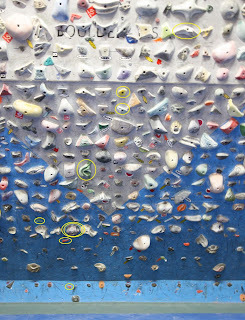 There are 4 taped climbs in CATS that are taped with various Spider Man stickers, the are very easy and cannot be harder than V3 and the easiest is probably V1. They are not supposed to be climbed open feet you are supposed to just climb them with tracking. 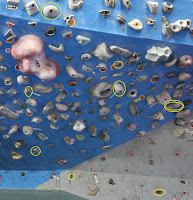 Some of them climb awkwardly because it is harder to set a problem with only 8 stickers. But they are good for the CATS neophyte or as warmups. I will post pictures to help with the location and lines. This is one of my most fun problems, big fun moves on decent holds, nothing really heinous to do just power around the wall. I was thinking this maybe was V11 as none of my friends could touch the moves, but I and a couple others flashed it(well I had to set it so it was not exactly flash, but I never fell on it) and Phil said I could not count it as CATS V11 if I were to do a points day so I guess it will get V10. And I will give a description as well: Start B3 with the green Orange Horny Toad jib, straight up to red ball, black ETCH pinch, big cross through to good White Fang pinch, White Smith sidepull, circular red two screw jib for feet, big move to the yellow ETCH sandstone. This is the first real campus problem I made up, although this is the full. The original just started high on the Lunar Flats. There are currently campus problems 1 through 5, plus a new sloper campus. They are numbered chronologically by when I set and sent them. Number one here is a nice friendly tension problem. 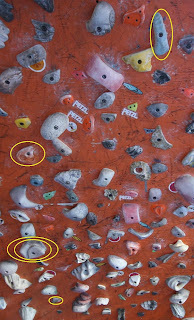 I am not sure if it helps or is possible to quickly onetwo through the crux to the lip, but if it is, don't do it, stick the holds. In general onetwoing is not very acceptable. I think the video here http://vimeo.com/6089275 makes things clear enough, if not drop a comment. This is a really good tension and power pinch and sloper problem. I originally put it up at V10 but it got a lot of attempts and no repeats until Paul sent after a few falls, so I guess it gets V11. A very old climb for the current CATS, this was the first climb I set in CATS when I moved out here and the walls were still being filled in from Nationals. 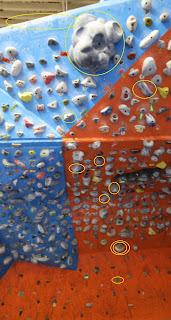 If you want to start climbing on the steep this is a must do intro problem with crimps, tension and a touch of power. The bottom is a little hard to see so here is a picture to help, after the last crimp in the picture the video should show it well enough; big move to finger bucket, come into undercut, up to three finger pocket dish thing, purple sidepull screw on, jug. This is a really good obvious line I saw after I put up some new holds. A variety of moves on pinches; compression, stabs, crosses it comes together pretty well. And tall people should not complain about the high foot near the end, it works perfectly fine for a friend of mine who is 6' 1"
Starts in good deep incut scoop, right foot on green Orange Horny Toad jib, left foot (which I do not start with, but some do) is directly left 8bolts on a strange right facing edge. The rest should be fairly obvious from the video. Green ETCH, Yellow ETCH, little black, big white, green font ETCH, Epic 50cent edge, Jug. Starts left hand fat pinch right hand Hudz plate, right foot straight down on a red jib on the kickboard. Jump into the fat Teknik pinch, left hand to red Teknik pinch, right hand red Pusher sloper, left hand strange brown seam crimp, right hand old school E-Grips jug pinch, jug. CATS(Colorado Athletic Training School) is a 10,000+ square foot training facility primarily devoted to gymnastics and climbing. 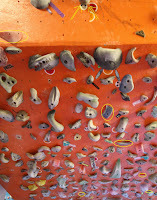 For becoming a stronger, better rockclimber there is simply no better gym. CATS does not coddle with too many jugs, big feet, dihedrals or silly climbing. Especially with a crew of friends, CATS is very fun as well compared to traditional gyms where you have to deal with crowds and poor setting. 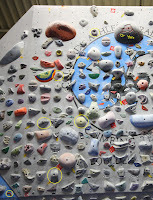 CATS is whatever you want it to be, you can spend all day doing 30+ move traverses, crush out 3 move power problems on the smallest crimps you have ever seen, or climb out the absolute pinnacle of training; the CATS steep wall. Not only is CATS the best place to train, but it is the cheapest. $5 for a day pass, which after 8pm gives you full access to the rest of the facility which includes bars, rings etc.